We already know that Samsung is holding another of its Unpacked events at CTIA in just a couple of weeks, but details have yet to be released. Whatever it is though, is sure to pack some sort of gaming or big-screened-multimedia punch. The nominees for CTIA’s “Hot for the Holidays Awards” have been announced with a mysterious and unannounced Samsung product listed under the “Gamer & Entertainment Enthusiast” category. If you look at the other items listed, you will see two of their tablets, so this could be the 7.7″ Tab that has yet to land in the states or as a few other sites have suggested, is the Galaxy Nexus. Rumored to have a 4.65″ HD screen (Super AMOLED HD? ), you would almost think that the next Nexus would have found its way into the “Gadget Guru” category – or would that have made it too obvious? A big HD screen on a phone does scream, “Play games on me!” though. Then again, wouldn’t Google want to unveil the next Nexus and not Samsung? While I would love for this to be the Ice Cream Sandwiched Verizon beast, I’m not willing to put a ton of money on that, just yet. The good news is that we will be there to find out. 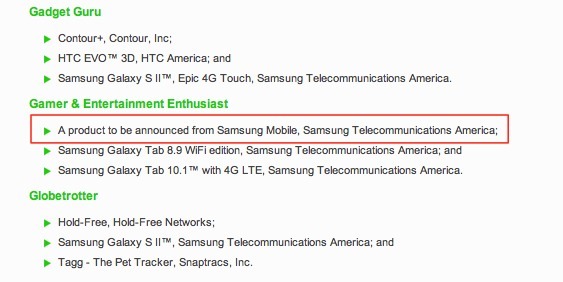 Update: Galaxy Tab 7.7 just cruised through the FCC. Would not be surprised if this is the device they announce. What do you guys think? Any guesses? Monday Poll: Which name would you prefer for the HTC Vigor?